Most people don’t realize it, but this nation was born in answer to prayer. God established it because people all over the world started crying out to Him for a place where they could freely worship God. As you celebrate Thanksgiving Day this year, remember God’s provision and the miracle He brought about all because people around the world were united in prayer. God answered those prayers by sending that first band of believers (people who knew His Name and carried His Book) aboard a little ship called the Mayflower. On board that vessel those believers entered into a covenant with Almighty God in the Name and in the blood of Jesus. Then the first thing they did when their feet hit the shore was to pray. It’s a good thing they did, too, because the devil hated what they were doing. He hated the idea of giving people freedom to worship God. If he could, he would have destroyed this nation before its birth; but he couldn’t do it then and he can’t do it now. He was stopped by the prayers of God’s people. Certainly the devil has done his best to mess things up along the way. There’s no question about that. As a result, this nation has been through some very dark times. But even in those times, the hand of God has prevailed—this nation has been preserved, and His purposes have been accomplished. In the late 1600s, for example, when hostilities arose between the European settlers and the tribal peoples, some cruel and terrible things were done. Take the case of the Squanto who was captured, taken to Europe and displayed in a cage as a “Savage from America.” Certainly the devil meant that for evil, but God caused things to happen that the devil hadn’t figured on. The little boy escaped from his captors and found refuge in a monastery. While there, he became fluent in English. He began reading the Bible, got saved and baptized in the Holy Spirit. When he finally had the opportunity to return to his homeland in the eastern part of the U.S., he found the colonists were having trouble learning how to raise crops in their new climate. Some of them were on the verge of starvation. What’s more, the Indians were attacking them, and they were on the verge of an all-out war. Do you know who stopped it? That young Indian man who had been taken captive years before. He stepped out on the battlefield and began speaking to both sides in their own languages. He let them know he was a believer in Jesus Christ, and he instructed them to put down their weapons. Sure enough, they held their fire. Before long, that young man was preaching the gospel to both groups. Under his influence, the Indians began to teach the colonists how to work the land in the northeastern climate, and the colonists began to teach the Indians some of what they knew. For 75 years, those people lived together in peace sharing their lives and their faith in the Lord Jesus Christ. 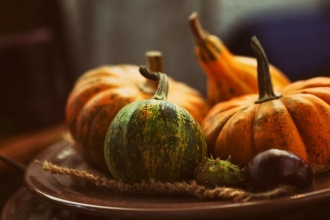 Their harvest celebrations together became known as Thanksgiving Day. As you celebrate this Thanksgiving Day, remember to thank the Lord for His provision and to remember the important role prayer played in our country’s formation and success. As believers we’re called to continue to pray, to “humble [ourselves], and pray” so the Lord will continue to “heal our land” (2 Chronicles 7:14). It’s a promise He’s kept for over 200 years, and one He’ll continue to keep. Happy Thanksgiving!